The Middle Ages were a time of widespread religiosity and devotion to the Roman Catholic church. The cult of the Holy Virgin was immensely popular, winning followers throughout Italy and all of Christendom. This trend is reflected overwhelmingly in the art of the medieval period, featuring frescoes, paintings, sculptures, and other tributes to Mary and the baby Jesus. Fully aware of this trend, and in order to inspire continued devotion (and thus, solicit financial support), churches and monasteries of the period frequently commissioned such art in the form of an altarpiece or other religious decoration. Artists like Giotto di Bondone stayed busy with these commissions throughout their career. In di Bondone's case, because of his revolutionary painting style and technique, he was even more in demand. Priests and other religious figures of authority - even the Pope - saw how worshippers responded to his emotional, life-like and profoundly moving frescoes and besieged him with requests to decorate their church. The Ognissanti Madonna was painted for a relatively unknown religious sect called the Humiliati. They were pious, devoted men who dedicated their lives to the service of God and the Holy Virgin, living on almost nothing and constantly recruiting new followers. They earned money and food by selling wood. 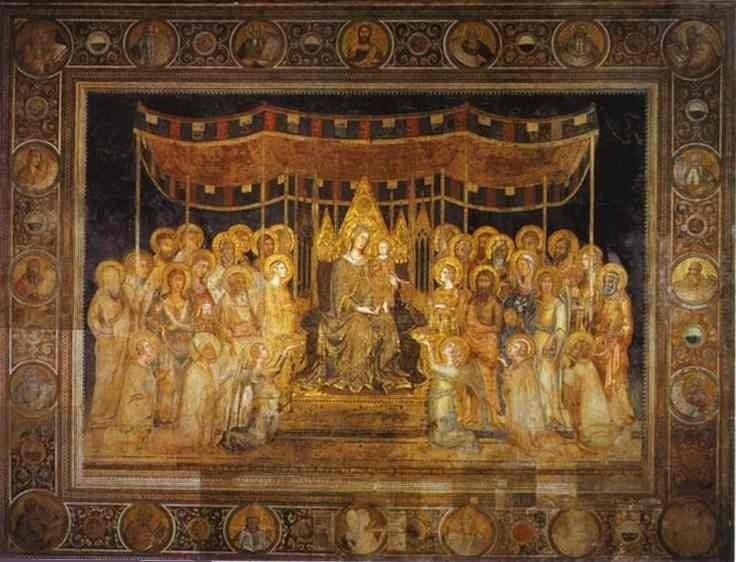 When the Humiliati leaders approached di Bondone at the beginning of the fourteenth century to commission the altarpiece known as the Ognissanti Madonna for their church, the Church of the Ognissanti (All Saints), he agreed immediately. 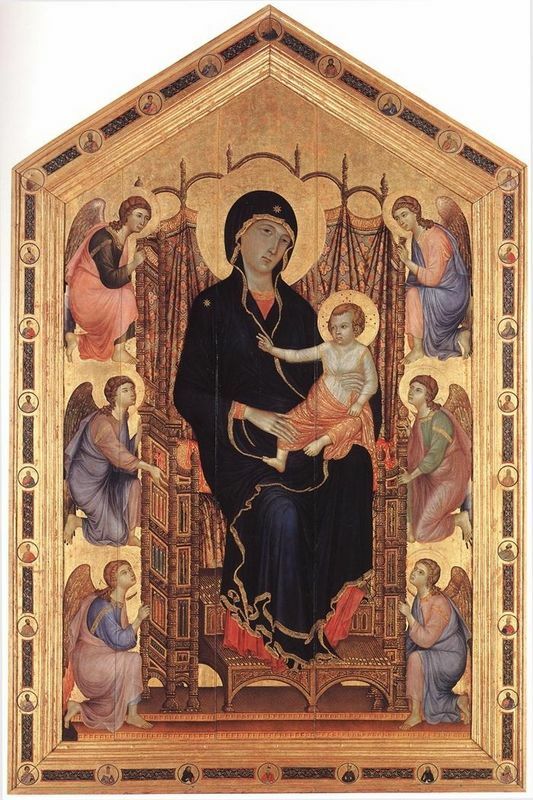 Thematically and compositionally speaking, di Bondone took cues from his master, Cimabue, and several other well-known painters of the Medieval period - like Duccio and Simone Martini - when he painted the Ognissanti Madonna. All of these artists were responsible for similar paintings of the Holy Virgin and baby Jesus. This type of painting, so common throughout the Middle Ages, came to be known as a Maestà, or majesty, and almost always featured the Madonna holding her child, surrounded by an adoring group of angels and/or saints. Di Bondone began his altarpiece for the Church of the Ognissanti in the early fourteenth century and finished a year or so later. He used rich golds and reds, along with a light palette of pinks and purples, to bring to life the dazzling majesty of the Holy Virgin and infant Jesus. He also embraced, in this painting as well as numerous others throughout his career, a painting style known as naturalism. Di Bondone was likely the first artist to put so much emphasis on painting not only things, but also people, as they were (or as he imagined them to be, in this case) in reality. 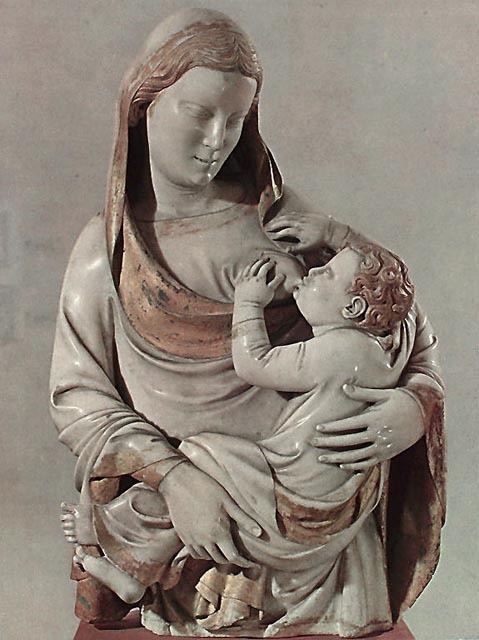 There is nothing to indicate that the Ognissanti Madonna, upon completion, was anything less than a critical success. It was situated for centuries in the church for which it was painted, the Church of the Ognissanti, an awe-inspiring, ten-foot tribute to the Virgin Mary and baby Jesus. Thousands of pilgrims visited the church and its famous altarpiece over the centuries until it was moved, near the beginning of the twentieth century, to the Galleria degli Uffizi in Florence.